Beijing has banned what trade authorities are calling “unofficial rice imports” from neighboring Vietnam. The move, ostensibly announced as closing a previously existing tax loophole, appears to be specifically targeted at Hanoi and does not affect other Southeast Asian countries sharing a border with China. The prohibition specifically addresses the overland, cross-border traffic of rice into Guangxi Zhuang Autonomous Region and Yunnan province, both of which share lengthy southern borders with Vietnam. These shipments are often brokered and carried out by individual Chinese brokers who often skirt paying national import levies, according to Vietnamese press reports. By centralizing bulk purchases of rice, Beijing could stand to generate substantial tax revenues.Two million tons of Vietnamese rice worth an estimated US$800 million were expected to imported through unofficial channels this year before the proscription went into affect. This number represents more than 30 percent of Vietnam’s total worldwide rice exports from 2013. Although billed as a tax collecting endeavor, the Chinese ban has obvious political undertones. Once-strong ties between the two countries have been markedly strained since the deployment of a Chinese oil platform in international waters sparked deadly anti-China riots in Vietnam this summer. Although the oil rig has since been removed, relations have not thawed and the rice import ban may be a way for Beijing to subtly punish Hanoi. The South China Sea dispute lately may have also played [an indirect] part in China wanting to diversify its rice import base as imports from Vietnam hit a substantial figure. China [received] over 66 percent of its total rice imports from Vietnam in 2013, while only one percent came from Cambodia. This article written was by Patrick Scally and first published 8/13 here on the GoKunming website. 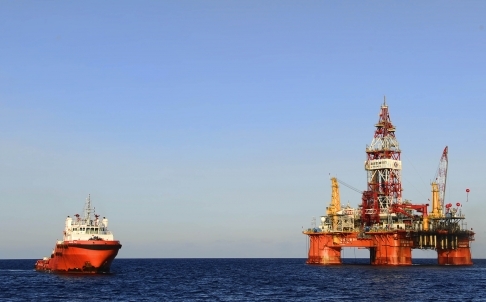 China’s oil rig, the Haiyang Shiyou 981, sits 120 nautical miles from the Vietnamese coastline. Photo: Xinhua. Following the deployment by China of an oil rig in disputed waters between China and Vietnam, anti-Chinese riots have swept Vietnam, bringing Chinese-Vietnamese relations to their lowest level in recent years. The demonstrations started shortly after China moved an oil rig, referred to as Haiyang Shiyou 981, within 120 nautical miles off the coast of Vietnam. This position is also 17 nautical miles off of the disputed Paracel Islands. The Paracel Islands lie at the heart of the controversy over the oil rig. The Paracel Islands are a group of small islands in the middle of the South China Sea with no native population. Both Vietnam and China place historical territorial claims to the islands. Prior to 1974, the islands were controlled by the navies of China and South Vietnam. Following a naval battle in 1974, China took the whole group of islands from South Vietnam. Following the reunification of Vietnam in 1975, the government of the Socialist Republic of Vietnam renewed its claim to the Parcels, and the dispute has continued ever since. The dispute over the oil rig and the Paracels also ties into different interpretations by Vietnam and China over the U.N. Convention on the Law of the Sea (UNCLOS), of which both Vietnam and China are signatories. Vietnam claims that the oil rig falls within the 200 nautical-mile exclusive economic zone (EEZ) granted to it by UNCLOS, and thus violates Vietnam’s territorial sovereignty along with UNCLOS. China claims that it falls within its territorial waters that are adjacent to the Paracel Islands it controls. Regardless of the validity of each of the two country’s legal claims, one thing clear through all of these murky interpretations of international law is that the placement of the oil rig has raised significant anger on the Vietnamese side. Vietnam has declared that it will “apply all necessary and suitable measures to defend its rights and legitimate interests.” At the 24th ASEAN Summit in Burma, Vietnamese Prime Minister Nguyen Tan Dung declared that China’s placement of the rig was “brazen”, “ gravely violates the international law”, and that China’s action was “dangerous”. The situation around the rig has only gotten worse since it has been deployed, with both sides claiming the other side has rammed its ships and used water cannons, while the Chinese have deployed ships to protect the rig, and have accused the Vietnamese of erecting barricades and fishing nets around the rig in order to impede the rig. Meanwhile, the situation on the ground on Vietnam has become violent. Anti-Chinese protests have erupted all across Vietnam in response to China’s actions, and the protestors have targeted foreign factories believed to be Chinese, but have also turned out to be Taiwanese, Singaporean, Malaysian or South Korean. More than 400 factories were damaged by the mobs. 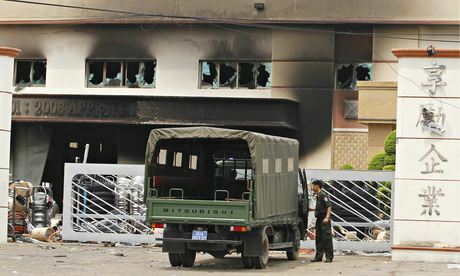 The casualties resulting from the protests are still unclear with the Chinese Foreign Ministry confirming that two Chinese nationals had been killed, while other sources said that 21 people had been killed. Over 100 are believed injured. China has charted planes and ships in order to evacuate 3000 Chinese nationals in Vietnam. At the time of this writing, it seems that the protests have mostly calmed with over 1400 protestors having been arrested, and Vietnam having deployed massive numbers of security forces throughout the country. However, what’s clear is that the formerly cordial relations between the two states have been seriously damaged, with China’s Foreign Ministry declaring that the violent protests had “undermined the atmosphere and conditions for exchanges and cooperation between China and Vietnam” and that the Chinese side was suspending diplomatic contacts, along with issuing a warning against travel to Vietnam. Meanwhile, the Vietnamese Prime Minister sent out a mass text message warning people not to participate in the protests, but at the same time calling for Vietnamese to “to boost their patriotism to defend the fatherland’s sacred sovereignty with actions in line with the law”. As Vietnam continues to deal with China, the Vietnamese government will likely remember the consequences if it is seen as being soft on China by the Vietnamese populace. And unless China moves the rig, China has likely just given the US further reason to justify its pivot to Asia. China’s Humanitarian Policy in the Philippines: Politics Over People? China has been no stranger to territorial conflict throughout its long and complex history, having met plenty of resistance while spreading its dynamic culture near and far. Today is no different, as intense disputes over tiny island chains in the South and East China Seas have left China in a state of particularly poor relations with some of its most important neighbors. These disputes, of course, do not bode well for maintaining reasonable terms over some of the region’s most important geopolitical issues. However, what has become equally as apparent—and potentially more important—is the way these conflicts are currently affecting the way China conducts humanitarian policies in the region. As China continues to rise toward the top of global power and influence, many assert that with it comes a rising role of global responsibility. What we have found thus far is that China does not appear interested in taking up that challenge. After Typhoon Haiyan—an exceptionally powerful storm—roared through Southeast Asia in early November and devastated parts of the Philippines, leaving the country’s death toll at over 6,000, China surprised the global community by offering a meager $100,000 in humanitarian aid. This, compared to the tens of millions of dollars in aid offered by many of the world’s most powerful countries, was perceived as particularly frugal and, to some, downright disrespectful. Understandably, China received quite a bit of backlash for its decision and soon thereafter increased its contribution to $1.6 million and committed state medical resources to the areas of the Philippines most affected by the disaster. However, China’s initial contribution seemed to clearly define its true opinion on the issue. Despite China’s late arrival to the hard-hit Philippines, its aid and assistance was, of course, still received warmly and excitedly by the victims. When a natural disaster afflicts a nation, political relations no longer seem to matter to many. 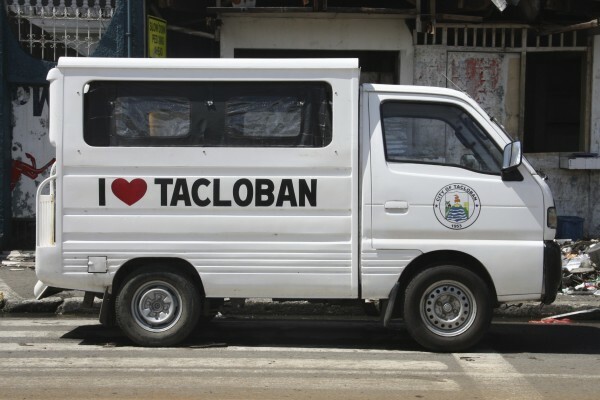 Filipino residents greatly embraced China’s support. Gina Tubigon expressed her appreciation after China’s arrival ensured the survival of her sister-in-law, Elesea. A 75-year-old suffering from a chronic respiratory ailment that worsened in the wake of the typhoon, Elesea may not have lived through the storm’s aftermath had it not been for the assistance of the Chinese medical team. Relieved about her sister-in-law’s stabilized condition, Gina expressed her appreciation, noting, “I know the relationship between the Philippines and China is not good, but we’re very thankful for the help.” This purely honest and non-politically calculated sentiment sums up the importance of cooperative relations between the two nations. It also suggests the possibility that a lack of increased aid and assistance from the Chinese government may have caused Gina to lose her sister-in-law. Relations between the two countries have been tumultuous for some time. As China continues its unprecedented rise, with an increasingly strong military accompanying extraordinary economic development, its Southeast Asian neighbors have become more and more anxious about territorial integrity. As China’s claims to the region become more extensive, the Philippines has been bolstering its defense and maritime law enforcement—with the help of US support—and has sought endorsements from ASEAN during the process. The Philippines, just like many of its regional neighbors, has endorsed the US’s recent pivot to Asia, as a mechanism to balance against Beijing’s increased maritime objectives. These exhaustive disputes have occurred between the two countries for decades, but have become further amplified in recent years, as China’s claim to maritime territory off the coast of the Philippines—the 200 nautical mile radius that makes up its Exclusive Economic Zone (EEZ)—has continued to expand. This includes a tiny rock called the Scarborough Shoal, which is no bigger that the size of a relatively small raft, yet vital to the two countries, as it holds important designation for charting territorial boundaries. The dispute between the two countries serves as a microcosm for a more general trend of tension and insecurity that has existed between China and its neighbors further south. Though these tensions have persisted for many years, amplified to greater extents during certain periods more so than others, they have ceased to have a highly significant or long-term impact on trade relations in the region. Yet, China’s frugal initial response to Haiyan relief reflected a new realm of implications—that these strained relations are having a negative impact on how China is handling its humanitarian policy in the region. As the countries of East Asia continue developing economically, their regional interdependence grows in import. They must be prepared to support one another in combatting natural international crises that extend beyond politics, such as typhoons of the magnitude of Haiyan, especially when these crises have potential for mutually severe impact on multiple countries in the region. China’s interest in extended control and influence over the region of the South China Sea—and East China Sea as well—has caused many to ponder whether Beijing also plans to embrace a wider role of responsibility regarding international crises. By offering such a small amount of financial aid during the immediate aftermath of this horrific storm, Beijing has implied that—at least for the time being—national interests remain the focal point of its current objectives, clearly trumping the need to be an international leader. 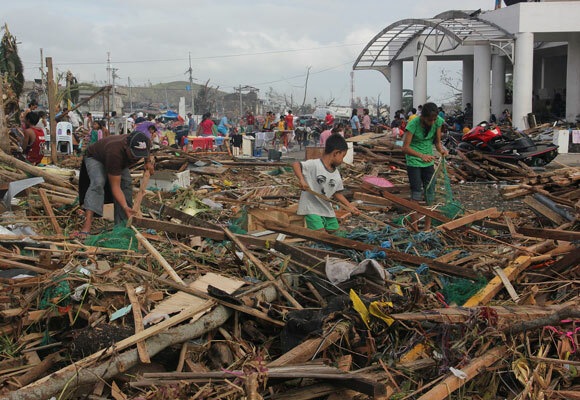 Of course, China’s stance toward the Haiyan relief effort is certainly not simple—with a range of complex considerations likely at play throughout the decision-making process. One fundamental question posed in response to China’s position is whether China is currently choosing not to emphasize the importance of more intimate relations with its neighbors—and the international community more generally—in order to instead commit more focus inward. As the Chinese government creates very carefully calculated strategies regarding domestic economic growth and infrastructural development, large numbers of financial resources and assets are presently committed to various projects throughout the country. Indeed, China’s current national economic milieu is one of many different parts. These parts include initiatives such as western economic expansion, raising the standard of living for larger populations, developing the nation’s energy sector in a push for cleaner sources of fuel to drive the country’s future development, further establishing modern industries throughout different parts of the country (i.e. financial, technological, and creative/cultural sectors)—and many others. In addition, unprecedented economic progress has also instigated a range of complex social strains, some of which have never before been seen. Actively seeking to deal with these increasingly pronounced issues, such as frustration with appallingly high levels of pollution, larger interest in individual freedoms and self-expression among Chinese citizens, and rapidly evolving national identity—to list only a few—the Chinese government is carefully undertaking its national strategy. As China consciously addresses these economic and social factors, simultaneous emphasis on non-political/economic international issues may not be on the immediate agenda. National leadership may currently ascertain that, still in an infant state of modern global importance and influence, this complex and highly dynamic country is not in a position to fully involve itself financially and logistically in these types of crises. However, regardless of China’s strategy with respect to regional and international stability—which at this point can only be speculated—what is clear is that China’s highly active position in geopolitical affairs has caused its western counterparts to expect a greater level of support from the rising giant towards these types of crises. Most important will be how China responds to this increased level of pressure and expected responsibility from its global economic partners as similar issues come about into the future. Nevertheless, in the case of Haiyan, this is only but one event in the midst of a lengthy modern history of strained relations between these two countries that has fluctuated in degree over the years. Therefore, only time will tell if China’s increasingly powerful international role will cause the economic powerhouse to engage the international community differently into the future. 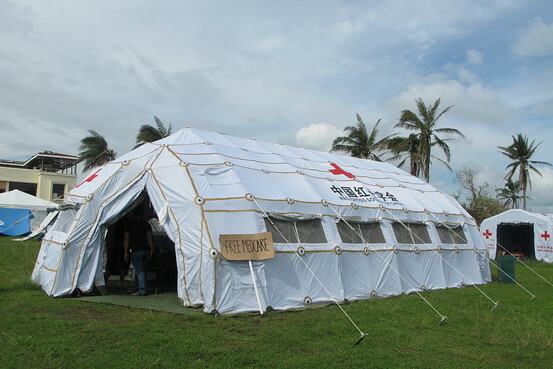 In the meantime, the aid and assistance that China did eventually provide to the Haiyan relief effort was effective and surely prevented many from severe illness or death. The victims of the storm as well as those on the medical relief team were not considering regional political tensions as lives were saved. This kind of understanding and expectation will hopefully be at the core of decision-making between China and its Southeast Asian neighbors into the future, as a rapidly changing world seeks to prioritize people over politics. On June 30, 2013, following the China-ASEAN Foreign Ministers’ Meeting held in Bandar Seri Begawan, capital of Brunei, China released a joint-statement with ASEAN in a post-meeting press conference, indicating that they have agreed to hold “official consultations” on a proposed Code of Conduct (CoC) to govern South China Sea “naval actions”. All parties agreed to move forward with consultations in upcoming meetings to be held in China during September later this year. Misleadingly or mistakenly billed as a significant paradigm shift by many English language news outlets, this development should not have come as a surprise to anyone. As early as November 2012, China already issued a joint statement with ASEAN at the 15th ASEAN-China Summit in Phnom Penh, Cambodia, marking the 10th anniversary of the Declaration on the Conduct of Parties in the South China Sea (DOC) and agreeing to “keep momentum of dialogue” in moving towards a formal Code of Conduct (COC). China also reiterated this commitment in April this year, following the 19th China-ASEAN Senior Officials’ Consultation.